A "babushka" used to spend her time babysitting grandchildren and gardening, but today's retirees are taking advantage of a wide range of opportunities. Olga Kuznetsova, who graces the floor of a dance studio in an elegant dress and heels, can hardly be described as a babushka, the Russian word for grandmother. The 55-year-old's recent retirement has given her the chance to do something about which she has long dreamed: learn to dance the tango. And she is not deterred by being the oldest in her group. Kuznetsova’s new routine involves meeting friends after class, and she is planning a trip to Europe with them in April. "I raised a child, worked three jobs, and now just want to live for myself," she said. While such activities might be common for retired women in other parts of the world, in Russia this is a novelty. The traditional image of Russian grannies is of old ladies sitting on benches outside apartment buildings, watching their grandchildren play nearby as they discuss the latest news and gossip. According to the Federal State Statistics Service (Rosstat), women outnumber men in Russia by 16.2 per cent. Although there are about equal numbers of girls and boys born in Russia, the country has a high rate of premature deaths among men. The average life-span of Russian women is 73, while for men it is 60. Currently one in eight Russian citizens — 12.8 per cent — is aged 65 or older, and in this age group there are more than two women for every man. But exposure to other globetrotting retirees – both in person and through movies and magazines – has given Russian women some new ideas for what to do with themselves after they escape the daily grind. Today, retirement can mean taking up a new sport or hobby, chatting online and helping not just their families, but also society. "My mother is 62 years old, and she is by no means a babushka," said Yulia Bushueva, managing director of Arbat Capital’s New Kremlin Fund. "She retired a couple of years ago, started driving, and is now thinking about courses in photography and English." Others are using technology for a new take on old hobbies. "My grandmother downloads computerised embroidery patterns and uses them in a special sewing machine," said student Yulia Vedinina. "If she doesn't understand something, she takes a video tutorial on Skype." 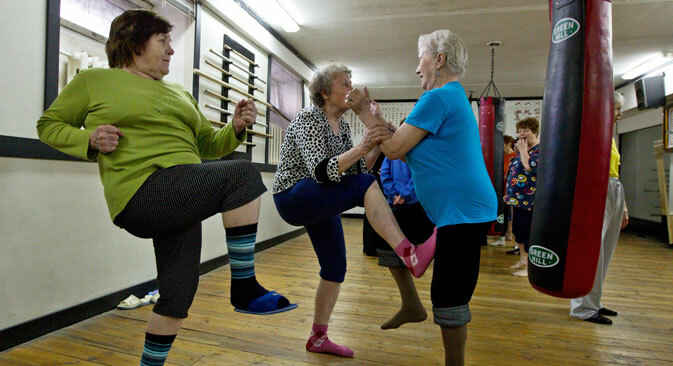 Body-and-soul courses aimed at older people are suddenly popping up everywhere in Moscow. A dance school for seniors recently opened at the All-Russia Exhibition Centre (VVTs) in northern Moscow. And the Mitino social service centre in the Moscow region now hosts an amateur puppet theatre. Under the Age of Happiness project, set up by Vladimir Yakovlev, founder of the business daily Kommersant, seminars are held on how to live, eat and stay busy, regardless of age and social stereotypes. And this more active type of retirement is not only on the rise in Moscow and St Petersburg. Gertruda Pankrushina, a former anaesthesiologist from Novosibirsk, enrolled in a computer course at the age of 70. "It wasn't easy, but I got through it," she said. "I now Skype my grandchildren, write emails, and get recipes online."